On the display were flights of devotional imagination concretised in the form of spellbinding carriers of the boon-bestowing Deity. 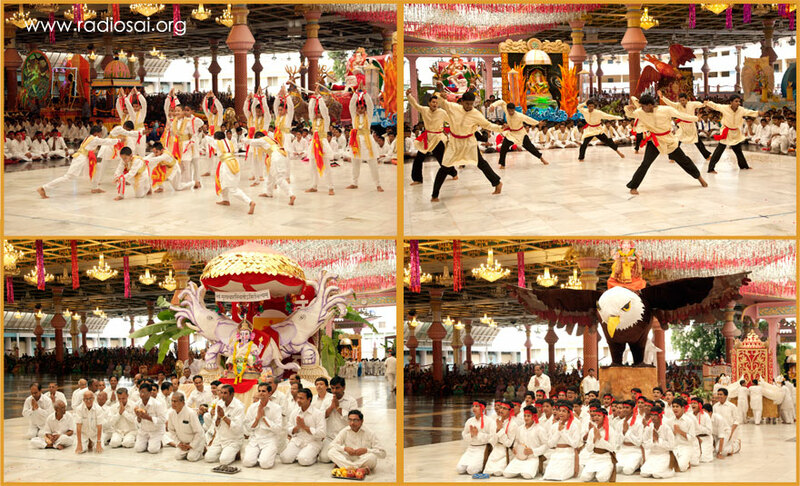 The Sai Kulwant Hall, and in fact whole of Puttaparthi, was a riot of high-pitched chanting, power-packed dancing and vibrant singing. Even as they were doing this, each group of students carrying their Ganesha Creations circumambulated the Sanctum Sanctorum. Finally, they proceeded to the waters to bid farewell to their cherished creative expressions of the Primordial One. The Ganesh Immersion ceremony in Puttaparthi was a sight for the truly privileged. Well, this occasion is extraordinarily special not only in Prasanthi Nilayam but in fact in all parts of India and abroad. It is on this festival every year that society witnesses a glimpse of unity seen rarely these days in our fractured communities. It propels people to congregate cutting across reservations of region and religion, status and power to celebrate one of the most fascinating facades of the Divine. How this elephant-faced, pot-bellied and mouse-riding deity has captured the imagination of man from centuries is truly mystifying and captivating. This September 11 in Prasanthi Nilayam is another harbinger of good times to come, for Ganesha is the Source of All Prosperity. Sadly, even as we ebulliently adore the Remover of all Obstacles this 9/11, the very mention of 9/11 unmistakably brings to our minds the menacing obstacle humanity had to surmount with severe losses and casualties, to say the least, 13 years ago. In the morning hours of September 11, 2001, four planes hijacked by unscrupulous elements scripted one of the sorriest pages of human history in recent times. 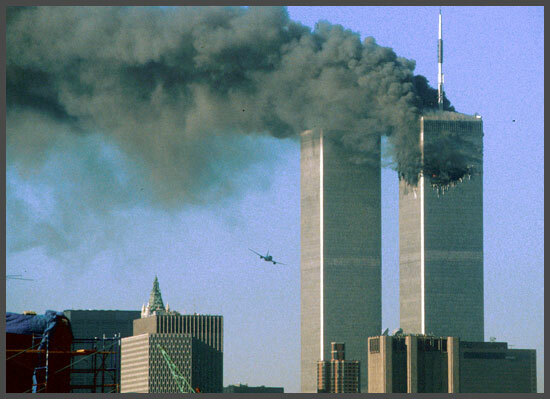 Two of them stormed into the 1776 feet tall North and South Towers of the World Trade Center, another rammed into the Pentagon, the headquarters of the United States' Department of Defense. The fourth crashed into a field in Pennsylvania, thanks to some of the passengers of this jet who attempted to take control of this plane. On that morning the powerful nation of United States of America, nay all countries of the world, shook. In a few moments 3000 lives were lost. Decades of human ingenuity and hard work was reduced to dust in a trice. Every year on this day various memorial services are held to remember the unfortunate victims of this fateful day; it also becomes an occasion when America reiterates its pledge to continue its war on terror. And since then many wars have been fought – violence has never ceased; in fact if anything it has only increased. If the Nazi blitz on Britain during the whole of World War II eliminated 40,000 civilians, the so-called 'War on Terror' post 9/11 has killed between 14,000 and 1,10,000 people every year since 2001. It is as if, if you go only by the number of casualties, a 9/11 has been happening every single year in the last decade. 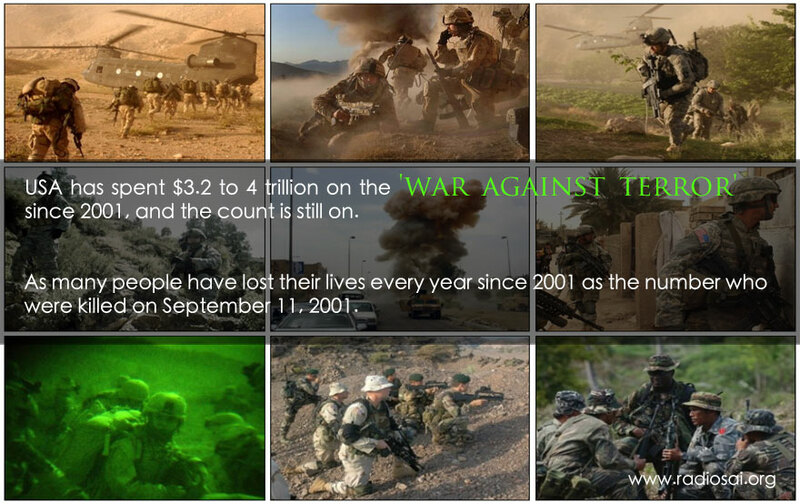 USA has spent $3.2 to 4 trillion on the war against terror since 2001, and the count is still on. Yes, this has adversely affected the economy of America and many other nations as well, not to mention the many social and psychological problems that the wars have created. One wonders then if this is indeed the right way to go forward? Is this really going to bring peace to our troubled world? Isn't there any other better way out? When we look for answers, interestingly they are found in events of history that have happened on this same day - 9/11. Unfortunately we never think of these other 9/11s which are actually guiding landmarks for mankind. The first is a historic event that unfolded in a dramatic fashion exactly 120 years ago in the same country in the city of Chicago. On September 11 1893, the Parliament of Religions opened its deliberations. Swami Vivekananda, the powerhouse of a patriotic saint from India, stunned the West when he took to the podium that day. He began by addressing the audience as 'Sisters and Brothers of America', and the distinguished crowd instantly rose from their seats and gave this charismatic Asian monk a loud applause. This was unprecedented. No one had related to the gathering in this fashion before. Here was a man who discarded formal words and spoke to them with the natural and candid warmth of a brother. Before we proceed further, here is some background to this event. 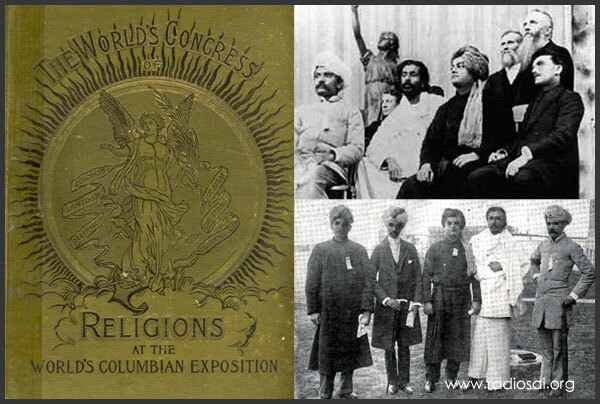 The Parliament of Religions meeting was organised as part of the World's Columbian Exposition to celebrate the 400th anniversary of the discovery of America by Christopher Columbus. One of the main purposes of this event was to disseminate knowledge of the progress and advancement brought about in the world and its culture by the western civilisation, especially through the progress of science and technology. As is evident, the goal was to glorify America and its culture, with emphasis on the 'Religion of Christ'. Therefore, it is not altogether improbable that some of the more enthusiastic Christian theologists, who were among the promoters of the Parliament, thought that this platform would give them an opportunity to prove the superiority of Christianity, professed by a vast majority of the progressive West. While this may have been one of the 'hidden agendas' of this conference, what happened on that opening day was something completely contrary to what the organisers had probably expected. Everything changed after Swami Vivekananda's eloquence reverberated in the hall. Therefore the entire assembly was in a manner of sorts awakened to a new dimension of thinking which transcended the petty comparisons between various faiths of the world. The Parliament of Religions in Chicago was held from September 11 to 27, 1893. Swami Vivekananda spoke on the inaugural day, on the last day and on four more occasions. This picture however is of September 21, the day the Swamiji did not speak. That is probably the reason he is not seen in this picture. In fact the spacious hall was packed with seven thousand people that morning. On the platform in the centre was seated in his scarlet robe Cardinal Gibbons, the Highest Prelate of the Roman Catholic Church in the Western Hemisphere. To his left and right were the Oriental delegates – Pratap Chandra Majumdar from the Calcutta Brahmo Samaj, Dharmapala representing Sri Lankan Buddhists, Chakravarthi and Annie Besant from the Theosophical Society, and so on. 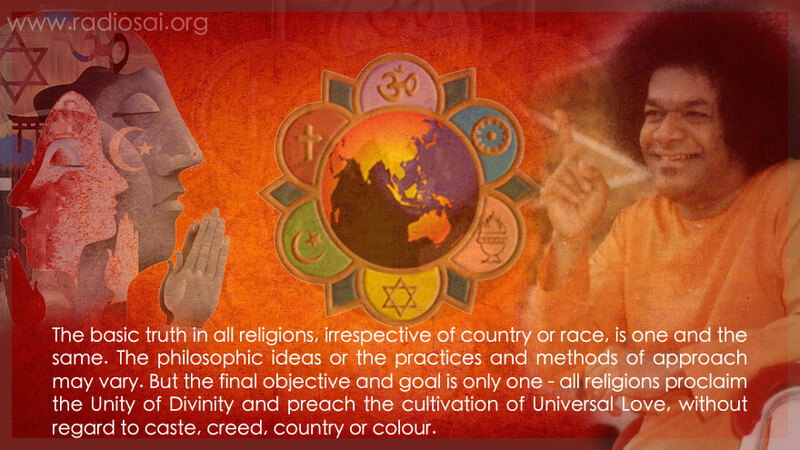 And along with them sat Swami Vivekananda, who actually represented no particular sect but the Universal Religion of the Vedas (which Baba often refers to as 'The Sanathana Dharma'). He spoke not on behalf of any specific faith or belief system, but for the religious aspiration of all humanity. And his tall personality stood out prominently with his gorgeous robe, large yellow turban, bronze complexion and fine features – no one could miss him. Then came one of the most potent messages of Universality and Forbearance. Indeed, in her more than 10,000 years of history, India has never invaded another land; it has been a melting pot of people of all faiths and climes, cultures and ideologies. Different invaders came, occupied this land and India embraced them. When people harassed elsewhere sought refuge here, she opened her arms wide and took them in. Swami Vivekananda emphasized this with real instances of history. Even though Swami Vivekananda is referring to the Jews and the Zoroastrians, these are just examples because India has given shelter to people of several creeds and beliefs. "Israel is in my heart but India is in my blood." Therefore the message is the same. In 1893 it came through a messenger of the Divine, and in 1983 it was reiterated directly by the Divine. It almost seems as if someone has written this reflecting on what is happening in the world today. But the Swami had rightfully diagnosed the problem of modern man and his mean mentality more than a century ago. September 11, 2001 was a major catastrophe no doubt, but it is not the solitary case. One estimate says that over 2,00,000 innocent civilians have lost their lives in various parts of the world right from United States and UK to Iraq, Afghanistan and Pakistan to countries in the Middle East and Africa, and now Syria. How much and in how many dimensions humanity has lost! The massive economic and social costs of war is something which not only United States but so many developing countries in Asia and Africa are grappling with till this day. In fact it is difficult to even put a figure to the loss countries like say Afghanistan or Iraq have suffered – large sectors of these nations have been ruined beyond recognition. Seven years ago, an interesting study was done to find out what could be the alternatives to finding and holding accountable those guilty of the 9/11 attacks. Was war the only possibility? The purpose of this research was to examine the success of various methods used against groups using terror tactics in 268 cases between 1968 and 2006. This report, called the Rand Report, made systematic examination and concluded that several other approaches have been much more effective than military responses at eliminating future attacks. And this included criminal justice responses and attempts to address the well-being concerns of both combatants, and of the broader populace that might support them. And only 7% were actually defeated militarily. Scientifically, this brought out how war and violence is the least effective means to bring in peace. In fact, military solutions have often created more extensive violent response and terrorism against the civilian population who are caught between two opposing forces. And civilian deaths also become incentives for terror group recruitment and revenge attacks. This is what one saw in the wars in Afghanistan, Iraq, and Pakistan – they served as effective recruiting platforms for new terrorists. Wars often create the conditions for additional violent conflicts over the new resources and new political alignments created by an initial invasion or occupation. That is when civil wars and criminal violence erupt again. 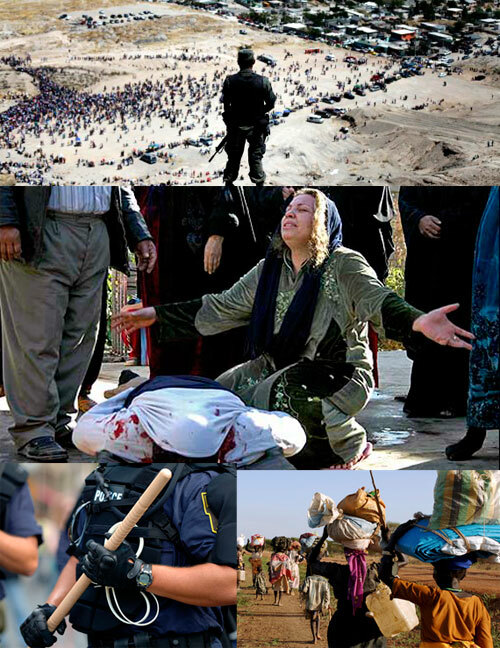 Humanity, in the recent times, has seen enough of this; Palestine to Libya to Syria to Somalia. It is the danger of these - 'sectarianism, bigotry and fanaticism' that Swami Vivekananda candidly pointed out. If only mankind had paid serious attention to his words on 9/11 1893! So the 9/11 address of Swami Vivekananda insightfully laid out the need of the hour for humanity, and what we as people should not do. Unfortunately, even though all these priceless words were well appreciated, especially in the West and are still remembered when everything else about the Parliament of Religions is probably forgotten, precious little has been done to put them into real action. Well, amnesia of sacred and timeless principles has happened time and again in human history. It did not happen only with Vivekananda. This brings us now to the second 9/11.